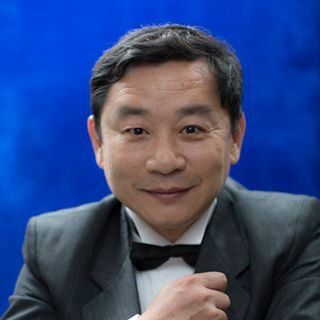 Born in 1963, Canon Huang studied wind ensemble conducting methods from master Chuin Liou. Since 1986, he has been the pioneer in introducing the art of concert band, marching band and jazz ensemble to Taiwan. He has contributed tremendously in the development of wind ensembles and marching bands. From 1993 to 1996, Canon Huang attended the Berklee College of Music for further education in jazz music with masters Jeff Stout in trumpet, and Frank L. Battisti in conducting methods. After returning to Taiwan, he actively participated events in promotion of the wind band music and held many concerts, summer camps, and conferences in several cities in Taiwan. Combining the eastern culture and western music traditions in performances, Canon Huang is widely acknowledged for his innovative spirit and his brilliant achievements. The bands he conducted were acknowledged for their excellent performances in the Taiwan Band Contest. Canon Huang is often invited to China to conduct and teach marching bands and wind ensembles. He is also known for his efforts in organizing the Taiwan Clinics (2007-2016) and the Taiwan International Marching Band Competition (2015-2016). Canon Huang is currently a band director in Taiwan and serves as the chairman of the Taiwan Band Director Association, Taiwan Marching Band Association and Art Consultant of China Marching Percussion Association. In 2016 Canon was invited to serve as the Board Director of WAMSB.